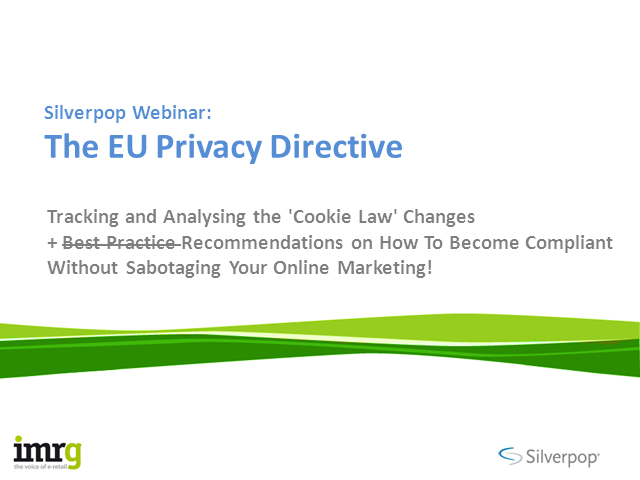 Join us at Silverpop, the IMRG, an expert panel and your peers for a deep dive look into the new Directive, with tips on how you can risk assess your marketing and put steps in place to comply. This enforcement has wide reaching consequences for any business using web tracking and cookies, and the potential to impact marketing departments across the globe. An analysis of Silverpop’s own marketing shows it affects everything from lead generation, to email nurturing, through to our website analytics and even customer marketing. So how can we as online facing organisations, balance the need to comply with the law, our business needs, and of course the visitor experience?